Kartikeya Sarabhai has been the Director of the Centre for Environment Education, (CEE) in India which he founded in 1984. Since the establishment, CEE has grown from a small Ahmedabad-based NGO into a major national and international centre in the field of environmental and sustainability education.In 2005 he became a member of the UN DESD Reference Group of UNESCO. He was responsible for organising the first international conference of the UN DESD in January 2005 and the 4th International Conference on Environmental Education in November 2007. 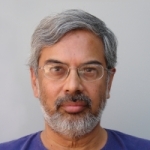 He is also the editor-in-chief of the Journal of ESD brought out by SAGE publications.He is a member of the Earth Charter International Council and the Vice Chair of the India National Commission for the IUCN. CEE is hosting an international conference on November 1 to 3, 2010 titled "Ethical Framework for A Sustainable World" to celebrate 10th anniversary of the Earth Charter. He is the member of several committees of the Ministry of Environment and Ministry of Human Resource Development of the Government of India including commission on Sustainable Development.He received the "Tree of Learning" Award from IUCN (The World Conservation Union) in 1988. In 2005, The Indian Institute of Human Rights presented Mr. Sarabhai with the "World Human Rights Promotion" Award. Founder and president of the Sarvodaya Shramadana Movement in Sri Lanka. He was born on November 5, 1931 in Unawatuna village in Galle District of Sri Lanka. He had his school education at Mahinda College, Galle. Then he attended a teachers college, after which he was a high school teacher until 1972 at Nalanda College Colombo. Ariyaratne started his work on Sarvodaya Shramadana Movement in 1958. He earned a Bachelor of Arts degree in economics from Vidyodaya University of Sri Lanka and later received an honorary doctorate of D.Litt. from the same university. He also received an honorary doctorate of humanities from Emilio Aguinaldo College in the Philippines. 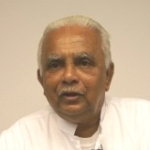 Ariyaratne is a devout Buddhist and continues to be active in Sri Lankan politics and community development. He received the Ramon Magsaysay Award for Community Leadership in 1969, the Gandhi Peace Prize from the government of India in 1996, the Niwano Peace Prize in 1992, the King Beaudoin Award and other international honors for his work in peace making and village development. In 2006, he received the Acharya Sushil Kumar International Peace Award for the year 2005. Other recipients of this award include John Polanyi and then in 2004, his Holiness, the 14th Dalai Lama. In 2007 Ariyaratne received the Sri Lankabhimanya, the highest National Honour of Sri Lanka. Ariyaratne, a strong believer in Gandhian principles of non-violence, rural development and self-sacrifice, has shaped the Sarvodaya Movement in ways that forged a significant link between secular principles of development and Buddhist ideals of selflessness and compassion. As a devout Buddhist, he has led tens of thousands of “family gatherings” and meditations with millions of people throughout Sri Lanka and other parts of the world. Prof. Katsunori Suzuki has been working on environmental administration since he joined the Environment Agency in 1976. He worked on regional environmental planning, waste management and recycling etc. He has been mainly working on international environmental issues since 1985. Prof. Suzuki worked for UN agencies including UN Economic and Social Commission for Asia and the Pacific (UN/ESCAP), the World Bank and the United Nations University Institute of Advanced Studies (UNU-IAS). As a member of Japanese delegation, he worked on international negotiations for the amendment of the Montreal Protocol, UN Framework Convenition on Climate Change and its Kyoto Protocol. He also promoted regional network on acid deposition, forest conservation in Asia. Since 2003, Prof. Suzuki promoted education for sustainable development (ESD) in UNU-IAS mainly, especially on regional centres on ESD all over the world, strengthening the role of higher education institutions. Prof. Suzuki has been working for Kanazawa University since September 2007 as a professor of Frontier Science Organization (until August 2010) and a professor of the Environmental Conservation Center (since September 2010). He is a Board member of ESD-J since June 2008. Professor of Rikkyo University, Directer of ESD Research Center of Rikkyo University, Senior Advisor for the Japan Council on the UN Decade of Education for Sustainable Development (ESD-J), President of Japannese Society of Environmental Education. Director of the Japan Environmental Education Forum (JEEF), and Nature Conservation of Japan, and also a member of the Commission on Education and Communication (CEC) of the World Conservation Union (IUCN). Fumiko Noguchi Born in Tokyo. Fumiko started her local community NGO activity while doing B.A of International and Cultural Studies at Tsuda Collage, Tokyo. She continued her NGO work after the graduation besides working at Citibank N.A. In 1997, she went to Australia for her further study at the master course of environmental education at Griffith University, Brisbane. She studied and lived in Australia for 7 years, organising ecotour programme with the Indigenous Australian elder, directing community radio programme, and being an active member for “Birthchoice” movement. Currently, she works for the Japan Council on the UN Decade of Education for Sustainable Development (ESD-J). With her 6 years’ carrier there, she has been mainly committed herself into networking NGOs in Asia on ESD through AGEPP Project (www. agepp.net/), as well as documenting and analysing case studies in Japan and overseas. Sophea TIM Mr. Sophea TIM, 28 years old, was born in Kampong Cham province, in the central region of Cambodia. He got Bachelor of Science (BSc.) in Agricultural Technology and Management in 2007 at Royal University of Agriculture (RUA), Cambodia and now he is a Master course student majoring in Natural Resource Management and Rural Development at RUA. For working profile, after Bachelor graduation in 2007, Mr. Sophea worked for RUA as the Assistant to Rector. Later, from April 2009, he has been employed by Institute of Environment Rehabilitation and Conservation based in Cambodia (ERECON-Cambodia Branch/ ERECON-CaM). His position in ERECON-CaM is Program Coordinator in International Environment Cooperation. In RCE Greater Phnom Penh, Mr. Sophea TIM is an Assistant Secretariat. He has been the representative of RCE Greater Phnom Penh to participate in the last 5th International RCE Conference in Curitiba, Brazil in last May 2010. Machito MIHARA, a researcher at Faculty of Regional Environment Science of Tokyo University of Agriculture and a voluntary program director at Institute of Environment Rehabilitation and Conservation, has been supporting to promote the food, agriculture and environment education at rural villages or elementary schools as a part of ESD activities in RCE Greater Phnom Penh, Cambodia. Takaaki Koganezawa ( Professor of Miyagi University of Education, Chair person of Greater Sendai RCE) My Specialty is agricultural and Rural Geography in Japan, Asia (India, China; inner Mongolia, Mongolia). In Japan, I am focus on the crisis of Agriculture and Rural area, where have serious aging issue and abandonment of farm land. In Asia, I focus on the direction of self-sustained agriculture. On Greater Sendai RCE, An ongoing problem is to clarify a common theme for Greater Sendai RCE to conduct activities, as a theme, we pursue ”Regional Development through Food Education to Advance environmental protection, Recycle-Oriented Life Style, and the Development of Agriculture, Forestry, and fishery” to connect the ocean, mountain and towns, i.e. the characteristics of the Greater Sendai area. HIRONO, Ryokichi, Professor Emeritus, Seikei University, Tokyo, is now Visiting Professor at the National Graduate Institute for Policy Studies (GRIPS) in Tokyo. Currently, he is holding various public positions at home and overseas and also sitting on the board of various foundations, research institutes, academic bodies, and civil society organizations in Japan and overseas. Involved in innovations in international organizations for over four decades and acting as chair of the Committee for Development Policy of the United Nations Economic and Social Council, he had a lot to do in installing Environment, Gender and NGO divisions in UNDP, instilling Social Dimensions into Structural Adjustment Policies of the World Bank, and initiating Human Development Report at UNDP. Prof. Hirono was also involved in initiating DESD as adviser to Prime Minister Koizumi at WSSD in 2002. Over 600 books, reports and journal articles have been published at home and overseas. Awardee of a number of the certificates of distinction by Japanese and foreign governments. Ranjana Saikia Director - Environment Education and Youth Services Ranjana Saikia is the Director - Environment Education and Youth Services, TERI. She started her career in 1984 with teaching profession. She has done her Masters followed by a degree in Education. She had worked with many reputed educational institutions and taught various subjects including social sciences, environmental studies etc. during fourteen years of her teaching profession. She joined TERI in 1999 and took over the charge of Environment Education and Awareness Area. She has over twenty six years of experience in the field of environment, education, community development, etc. and undertaken several projects and awareness activities with focus on Climate Change and environment. She has held several positions in TERI and made significant contribution towards sensitizing the teachers and youth on topics related to water, solid waste, air pollution, climate change, biotechnology, biodiversity, etc., with an aim of increasing their awareness and knowledge on the pertinent issues. Through the course of her career she has attended a number of international and National conferences, seminars and workshops and has also coordinated a number of these events. She was a visiting Researcher to IGES, Japan for a period of three months and worked on a book on Climate Change for high school children. She has also authored several books and has contributed to publications and journals. The chairman of RCE (Regional Centers of Expertise on ESD) Chubu and a professor of the Nagoya University Graduate School of Environmental Studies. Tsuneo Takeuchi was born in 1954, in Aichi Prefecture, Japan, and graduated from the School of Economics at Nagoya University. He was in charge of water quality control, climate policy 3R policy etc. at Japan’s Environmental Agency and the Ministry of the Environment from 1977 to 2006. Since 2006, he has been working at Nagoya University. He is currently involved in studies including Study on strategic urban planning and assessment of low-carbon cities (co-researcher) and Study on strategic major CO2 reductions and assessment of self-reliant local economies and employment creation (head researcher). He has also written several books, including Environmental Restructuring-Experiences from Germany - (2004), Integration of Environment and Welfare (coauthored, 2008), Low Carbon Cities (coauthored, 2010), The World of the Social Environmental Studies (written and edited, 2010). Reita Furusawa Reita Furusawa got B.A., M.A, and M.Ed. degree at Temple University (USA). After that, he has conducted anthropological researches in Ghana as a doctoral student at Nagoya University Graduate School of Letters. During the EXPO 2005 (Aichi EXPO), he has drafted an official joint message, “learning How to Lover diversity,” as a representative of Japanese youths with other representing youths of eight countries. Currently, he is a researcher at Chubu University, Chubu Institute for Advanced studies (2007~) and International ESD Center (2009~). In addition, he is a secretariat of RCE Chubu, one of the United Nations University’s acknowledged Regional Centres of Expertise on Education for Sustainable Development (RCE-ESD) since 2008. YARIME Masaru YARIME Masaru is Associate Professor of the Graduate Program in Sustainability Science (GPSS) of the Graduate School of Frontier Sciences of the University of Tokyo. His research interests include corporate strategy, public policy, and institutional design for sustainability innovation, university-industry collaboration, science, technology, and innovation policy, and structural analysis of knowledge creation, diffusion, and utilization. He contributes to various international expert initiatives on sustainability, including the Integrated Research System for Sustainability Science (IR3S), European Sustainability Science Group (ESSG), Forum on Science and Innovation for Sustainable Development of the American Association for the Advancement of Science (AAAS), and the Sustainability Ad Hoc Committee of the Institute of Electrical and Electronics Engineers (IEEE). He also serves as one of the editors for the journal Sustainability Science. He received B.S. in Chemical Engineering from the University of Tokyo in Japan and M.S. in Chemical Engineering from the California Institute of Technology in the United States. He studied in the MERIT-UNU/INTECH Ph.D. Programme on the Economics and Policy Studies of Technical Change and received his Ph.D. from the University of Maastricht in the Netherlands. Previously he worked as Research Associate at the Research Center for Advanced Science and Technology (RCAST) of the University of Tokyo and Senior Research Fellow at the National Institute of Science and Technology Policy (NISTEP) of the Ministry of Education, Culture, Sports, Science and Technology (MEXT) of Japan. Jiang Dahe was Graduated in 1967 from Haerbin Engineering College, entered China University of Science and Technology in 1978 for graduate studies, and was sent in 1980 to City University of New York of USA where he obtained Master’s Degree in 1982 and PhD in 1984, majoring in fluid mechanics for turbulent diffusion. He came back Shanghai at the end of 1984 and joined Tongji University, College of Environmental Science and Engineering, where he was promoted from Lecturer 1985, Associate Professor 1987, and Professor 1992. Jiang offers courses of Air Pollution Meteorology, Environmental Fluid Mechanics, Hydraulics, Hydrology, Environmental Information Management. He was a trainer of the “National Advanced EIA Training Program” in 1991 on environmental modeling, a senior consultant of “Shanghai Emergency Response System for Hazardous Chemical Transportation Accidents” in 1993. As a foreign researcher, Jiang worked in Toyohashi University of Technology of Japan from Dec. 1993 to Mar. 1994, as a lecturer taught in Dept. of Mechanical Engineering of University of Hong Kong in 1995 to 1998. Jiang was a member of the Atmospheric Environment Branch of the National Association of Environmental Science of China. Since May 2002, Jiang serves the Director of the Office of UNEP-Tongji Institute of Environment for Sustainable Development (ESD). Jiang actively takes part in UN “Decade of Education for Sustainable Development (DESD)” program, in charge of organizing international leadership programs, international Master’s Degree Program in Environmental Management and Sustainable Development, and offers courses in English: Practice in Sustainable Development of China, and Climate Change and Response etc. Jiungchunn Tang received his Doctor’s degree from Nagoya University of Japan in 2004. He is now the associate professor at Nankai University in China. He is also the vice director of "Key Laboratory of Pollution Processes and Environmental Criteria (Nankai University), Ministry of Education." His research is concentrated on waste disposal and ecological restoration. He is undertaking a national key research project (863 Projects) on bioremediation of petroleum contaminated soil in oil field and he also took part in the research about "biowaste refinery in Asia" organized by EcoTopia Science Institute, Nagoya University. He was involved in the research on Sino-Singapore Tianjin Eco-city. He thinks that ESD should be proposed in China to coordinate the economic development and environmental protection. Development of a communication bridge between residents and researchers is important for ESD in China. Danai Thaitakoo is a lecturer in the Department of Landscape Architecture, Chulalongkorn University, Bangkok, Thailand. He received a Bachelor's degree in Landscape Architecture from Chulalongkorn University, a Master's in Landscape Architecture from Harvard University and a PhD in Environmental Planning from the University of California, Berkeley, USA. His research and teaching interests lie in the field of landscape and urban ecology and sustainability with an emphasis on landscape changes, and landscape dynamics. He is currently working on a research project focusing on urban-rural inter-mixed, urban-rural interactions and changes, the dynamics of urban-agricultural fringe, ecological services of the agricultural landscape, urbanization and landscape ecological changes. He is also working on a research project focusing on hydro-ecology of a landscape and integrated water systems emphasizing human ecosystem in terms of resilience and adaptation of landscapes and humans and ecological and cultural co-evolution and sustainability. Vice president, Environmental Partnership Council (EPC), Project coordinator / Consultant, Global Environment Outreach Centre (GEOC). After serving as an NGO activity coordinator for WSSD, served as a committee member for establishment of ESD-J. Interested in NGO empowerment, partnership building for a sustainable society. Involved with several environmental NGOs. Currently a board m ember of Africa Japan Forum (AJF), and Japan Civil Network for Convention on Biological Diversity, member of the board of trustees, Japan NPO Center, Director, School of the Earth (private school for agricultural experiences).